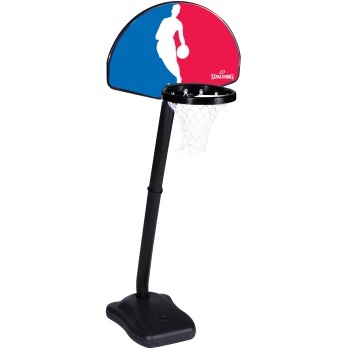 Spalding 5HNBA5 Youth Basketball System - 24 inch Backboard, One-on-One model. Shipping Included in the pricing for shipping to anywhere in the continental 48 States. Spalding Youth basketball hoops are great for young players to begin learning the game. The hoop adjust from 52 inches high, all the way down to 32 inches so even the youngest of players can begin to love the game. The height adjustment mechanism uses a telescoping pole. Included in packaging is a youth, 5 inch Basketball. 24 inch wide plastic backboard. The plastic material on this system is very tough and can be used either indoors or outdoors. Includes a 10 inch diameter, plastic-molded rim. Net is a child-safe, non-slip net. Rim Height adjustable from 32 inches to 52 inches. Height Adjust using a telescoping pole. This system is great for either indoor or outdoor use. Comes with a 5 inch youth basketball. Comes with a portable, 1-gallon base that can be filled with either water or sand. Product Packaging Dimensions: 16.54" x 7.48" x 31.50"
Product ships via FedEx. Typically takes 1-2 business days to leave the warehouse and 3-5 business days in transit time. Competitive Edge Products is an authorized reseller for Spalding Youth Basketball Products. Perfect for toddlers. Its a little bit too small for ages seven or eight and up. I guess its not really too tall, but there are better hoops for their ages. Impressed by the quality. Its not metal, but its also not $100. Colors are nice and bright and you can move it very easily. Fast Shipping: Orders for the Spalding 5HNBA5 generally leave the warehouse within 1-2 business days. Dimensions: 32" x 17" x 7"